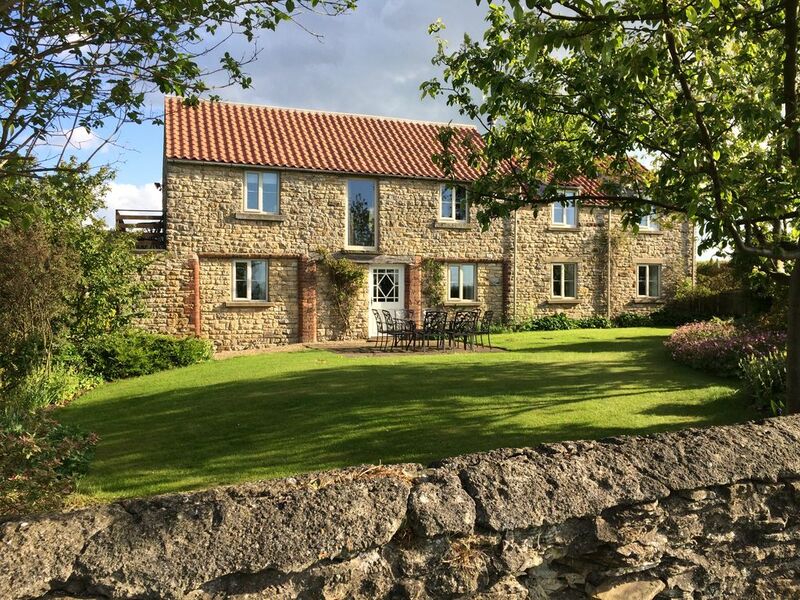 The Granary is a charming holiday cottage situated in the beautiful rolling countryside of the Yorkshire Wolds and wonderful views can be seen from all rooms. The property is large and spacious and has been lovingly converted, blending a contemporary living space with charming features such as original beams and exposed stone walls. This 4 bedroom property provides accommodation for 8 guests (2 extra futon beds possible on short breaks for children only) or for a larger group it may be let with our other cottage Mistal which is next door and sleeps up to a further 4 guests. The living accommodation is on the first floor. The lounge has an Inglenook fireplace with a wood burning stove, creating a really cosy atmosphere. There are two four seater settees and 2 armchairs. A flat screen television, freeview, DVD, music centre and library are also provided for your entertainment. Adjoining the living room is a games room that will keep you entertained for hours. The Granary sleeps 8 (plus two futon beds on short breaks children only) and The Mistal sleeps 4. Both cottages are very well equipped and kept up to date. We are located 2 minutes from the Village of Burythorpe There is so much to see and do. York is just 30 minutes away, and Malton 10 minutes away, while the cliffs and beaches of the Yorkshire Coast are easily reached in 45 minutes. A favourite day out is to visit Castle Howard, with its magnificent house and gardens. The Yorkshire Wolds, now becoming famous through the paintings of David Hockney, are a delight, and are right on our doorstep! This is fantastic walking country, and a footpath runs right by the property, taking you to nearby Birdsall. Other paths lead into the Wolds for spectacular views. Equally, cycling here is a delight, with quiet lanes and routes to suit every level. In the fields around the property, you will hear skylarks sing, and see buzzards soar. Deer are frequently sighted. This is a truly unspoiled corner, and it is no surprise that many of our visitors return year after year to escape and unwind. Each property has its own garden area and also their is a large lawned area for ball games including croquet and for tennis fans, we have a full size grass tennis court available May - September. Ample car parking is available for residents. Electricity, Oil and logs are all included. To keep the property to the high standard of cleanliness it is strictly non-smoking and we do not allow pets. Bookings are from 4 pm on the Saturday of arrival until 10 am on the day of departure. Short break prices are available in the low season for 2,3 and 4 night stays starting at £250 for 4 guests/2 nights. Please contact directly for price details. I live on site and have run the holiday cottages for nearly 7 years now. I have lived in the area all my life and studied Business and Rural Tourism at Bishop Burton Agricultural College. There is so much to see and do. York is just 30 minutes away, and Malton 10 minutes away, while the cliffs and beaches of the Yorkshire Coast are easily reached in 45 minutes. A favourite day out is to visit Castle Howard, with its magnificent house and gardens. The Yorkshire Wolds, now becoming famous through the paintings of David Hockney, are a delight, and are right on our doorstep! This is fantastic walking country, and a footpath runs right by the property, taking you to nearby Birdsall. Other paths lead into the Wolds for spectacular views. Equally, cycling here is a delight, with quiet lanes and routes to suit every level. In the fields around the property, you will hear skylarks sing, and see buzzards soar. Deer are frequently sighted. This is a truly unspoiled corner, and it is no surprise that many of our visitors return year after year to escape and unwind. We look forward to welcoming you to the Granary and the Mistal soon! Peaceful rural location with space yet so much to see and do close by. Grass Tennis Court available 1st May to September. The house was stunning, the photos were great but they didn't do justice to just how lovely the property is. We had many family members come and stay with us over the time we rented out the property and every one of them absolutely loved it. We made lost of awesome memories together and will look back fondly at this experience. The information provided by the property owners helped immensely. We were able to locate the property without any problems, and the suggestion to have food delivered was a great one and helped us settle in after our long journey from Australia. We definitely plan on coming back and would like to thank the owners for their help over the time we were there. We loved it. Thank you for your review and pleased you enjoyed your stay. We had a wonderful short break at The Granary with our four children. The location and setting is absolutely perfect, with beautiful panoramic views of the surrounding countryside. The cottage is large and very well equipped for families. We brought two bags of toys with us, but they stayed in the car as there is so much there for children. The gardens and grounds are very well kept and provide a spacious and safe environment for children. We have stayed in many holiday cottages over the year and this is definitely one of the best. A1 for cleanliness and comfort too! Highly recommended. We had an amazing week at The Granary. The countryside setting was stunning, as were the gardens and of course the lawn tennis court, which was greatly enjoyed by all the family. The house was so spacious and comfortable it could not be faulted. A great find! Well done Sarah! Lovely property. Seven adults stayed at this holiday home and had a fabulous week. The house was well equipped and comfortable.The weather was particularly kind with sunshine and blue skies which enhanced the terrific views. If there was a grumble an extra bathroom/shower room or even separate WC would have made life simpler. Never the less this wouldn't stop us returning. Lovely rural location - about half mile walk to the village and the pub (torch recommended). Warm, spacious and comfy property with plenty of everything you need including a games room which kept the kids entertained. Host was helpful and amenable. Hard to fault it. The Granary was great. There were 6 of us on a family holiday covering 3 generations. Very peaceful location - it was wonderful to hear and savour silence. The cottage was very spacious and extremely well equipped with a good sized private garden. The views from upstairs were wonderful - fields, hills, woodland. Lovely welcome pack, warm atmosphere, very rustic. Very clean, bright bedrooms. Games room was a bonus, equipped with toys for kids and grown ups. We wanted somewhere off the beaten track, but still within travelling distance of the joys of Yorkshire and were not disappointed. We would certainly recommend The Granary - many thanks! Thank you very much for your comments, and pleased you enjoyed your stay in The Granary and Yorkshire. The Wolds Way and the Centenary Way are close by and we're a perfect base for walking, with several public footpaths easily accessible directly from the cottage. The market town of Malton offers plenty of holiday entertainment, including a 27 hole golf course and ample real ale pubs. The North Yorkshire Moors are 20 minutes drive, Scarborough 40 minutes, whilst the historic city of York and its major attractions is 25 minutes drive away. Prices quoted for The Granary are based on up to 8 guests for 7 nights. Two single futon beds (Children only) in the games room are available at a cost of £25 per person per stay. Short Breaks start at £250 for 4 guests 2 nights additional guests £55 per person. 3 Nights 4 guests £280 additional guests £60 per person and 4 nights 4 guests £300 additional guests £65 per person. Please contact the owner for prices and availability. Short Breaks excludes from Easter to 6th September & Christmas/New Year Sorry no pets are permitted to stay or visit during your holiday. Non Smoking.